You don’t need to spend hours in a gym or on the roads to log a run that burns major calories and gets you fitter -- you don’t even have to spend one hour. A simple two-mile jog -- dialed in to maximize how you move, think, and feel -- can get and keep you in great shape, and with only a tiny time commitment. 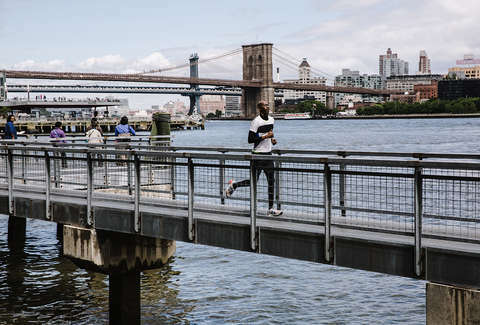 From psych-up advice to essential tech, we’ve got the tips you need to turn a couple of miles into a fast, efficient workout that builds endurance and strength. Now you just need to figure out what to do with the rest of your day. Some experts say you can burn up to 100 percent more calories while running up a hill than you would running the same speed on a flat surface. What’s more, you’ll better build your hamstrings, glutes, and take-off power, too. You don’t need a ton of inclines to accomplish this -- adding in just a few minutes’ worth of heart-pumping hills to a 20-minute jog is enough to make (and feel) a difference. While you jog, veer off the pavement to run on dirt, grass, sand, or trails. This helps keep your mind more engaged, and you’ll fire more of the small, stabilizing muscles that help improve balance and overall strength. Use an app like Map My Run to find a route that helps you hit varying terrain. Pump-up tunes are a legit way to coax you to run faster; according to a 2011 study published in the Journal of Sports Science & Medicine, the music boosts your mood, and in turn, boosts your performance. The key: finding songs with the right beats per minute (BPM). The ideal BPM will help your legs turn over faster and keep your energy up. If you’re jogging at a low-to-moderate intensity, look for songs at 130 to 140bpm (for example, P!nk’s “Raise Your Glass,” Journey’s “Don’t Stop Believin’” and Usher’s “DJ Got Us Fallin’ In Love”). If you’re hitting more moderate-to-high speeds, opt for 140 to 160bpm songs (Outkast’s “Hey Ya!,” Taylor Swift’s “Shake It Off,” The Beatles’ “I Saw Her Standing There”). Revving your pace, then slowing back down to a jog, has a trifecta of benefits. 1) You burn a ton more calories than a steady-state pace, and you create an afterburn effect that helps you zap more calories even after you’re done working out. 2) The run literally goes by faster. 3) You condition your lungs to take in more oxygen and process it quicker; this means that the next time you run, sprinting will feel even easier, and you’ll be speedier. Here’s an easy way to work in bursts: After five minutes of jogging, sprint for 20 to 30 seconds, then recover with a light jog for one to two minutes; repeat until you’ve covered your two miles. It doesn’t have to be some fancy, $500 gizmo. Looking down at a simple activity monitor that tracks distance, pace, and calorie burn while you run can give you the kind of positive feedback (“Holy hell, I’ve gone farther than I thought!”) and gentle push (“I totally have enough left to speed up for this last quarter mile”) that you can’t get when you’re just winging it. And by that we mean wear something that makes you feel like a hustler, whether that’s a new performance tank, a sleek pair of running tights, or a race tee from that 5k you just smashed. Feeling confident in how you look absolutely translates to feeling confident in how you run -- i.e., faster, smoother, and with more swagger. We know it’s more work, but trust us: add bodyweight strength exercises into the middle of your run. After your first mile of jogging, stop to do three sets of 10 jump squats, 10 push-ups, and 10 sit-ups, taking as little rest as possible. Then polish off your last mile, aiming to do it faster than your first. Know that the extra lung- and leg burn you’ll feel while running after the strength work will pay off in stronger, leaner muscles. Call up that buddy who’s, like, 10 seconds faster than you per mile and ask him or her to pair up for your run. A study by researchers at Santa Clara University shows that the subtle competition will help you put in harder work than you could’ve done solo -- and you’ve made the workout time double as a friend meet-up. Two birds. If you’re on your run and the “Ugh, I don’t want to do this” feeling hits, combat it with some seriously sunny personal dialogue: “You know you’ve got this” or “You can totally crush this distance.” Simply having these positive mantras at the ready is proven to reduce how tough running feels and prompt you to go farther, according to a study in Medicine & Science in Sports & Exercise. And whether it feels silly or not, actually say the words aloud versus simply thinking them. Research shows this helps motivate you more, because saying is believing. Recalling a few simple form cues during your miles will help you run faster and more efficiently (read: look more like Usain Bolt than Phoebe from Friends). Our top five: Imagine there’s a balloon with a string connected to your head, lifting you up (you’ll keep your torso upright, which prevents fatigue). Lean slightly forward (this boosts momentum). Relax your arms, and swing them directly forward-and-back, not out to the side (it helps you maintain speed and energy). Picture you’re running on super-hot coals (you’ll decrease ground-contact time, making you faster). And, finally: smile. No, really -- using those facial muscles will trigger every other muscle to relax, and boom, running instantly feels easier. Marissa Stephenson is an ACE-certified trainer and former Runner’s World deputy editor who’s raced more than two dozen half-marathons and marathons -- but still loves to maximize her minutes for a quick couple miles.